ENDORSED EFFECTIVE RELIABLE. 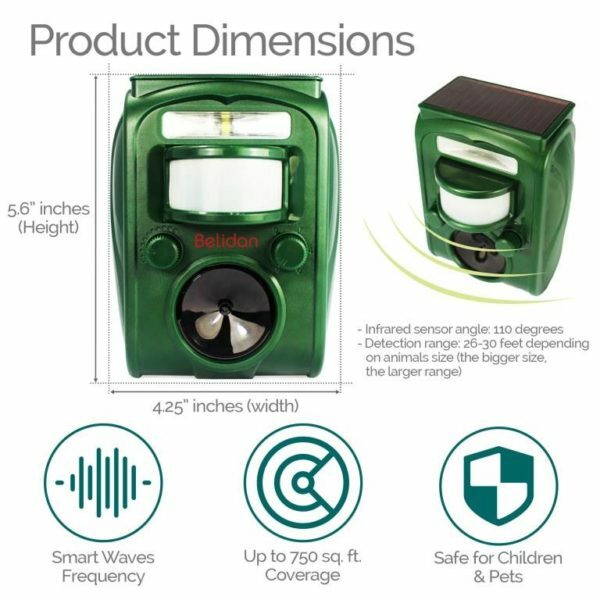 This animal repeller scares away unwanted animals such as raccoons, skunks, birds, mice, rats, cats, dogs, deer, fox and others by emitting ultrasonic waves and flashing LED lights. Large effective range of up to 750 square feet. Harmless to humans and environment. No poisons or traps. Eco-friendly. SOLAR POWERED & LARGE SOLAR PANEL. Works on highly efficient solar polycrystalline silicone battery, collecting sun power with high efficiency for operation at night or cloudy, rainy days; included 3x AA Ni-MH cost effective long-duration rechargeable batteries (better than Ni-Cd). 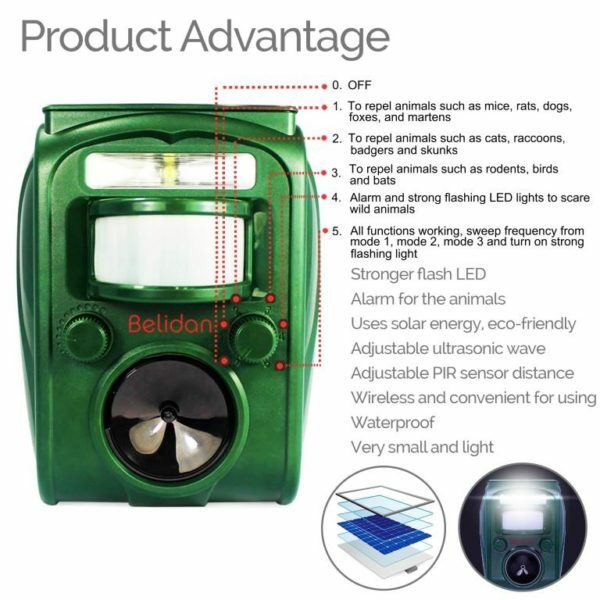 This is an upgraded model with a stronger flashing LED light and an alarm for the animals as new features. EASY TO USE. Adjust the distance sensor using the sensitivity knob and set the frequency knob based on the type of animal, plug the animal repeller into the ground or hang it on a fence or wall. 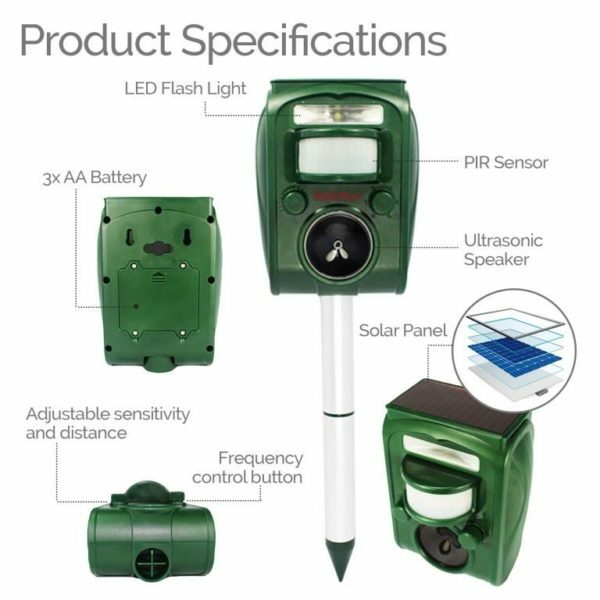 Perfect for outdoor use like driveways, lawn, gardens, farms, yards, or even camping. Can be used indoors in the basement, attic, garage or on a boat charged by a 9V adapter (not included). WATERPROOF & WEATHER RESISTANT. 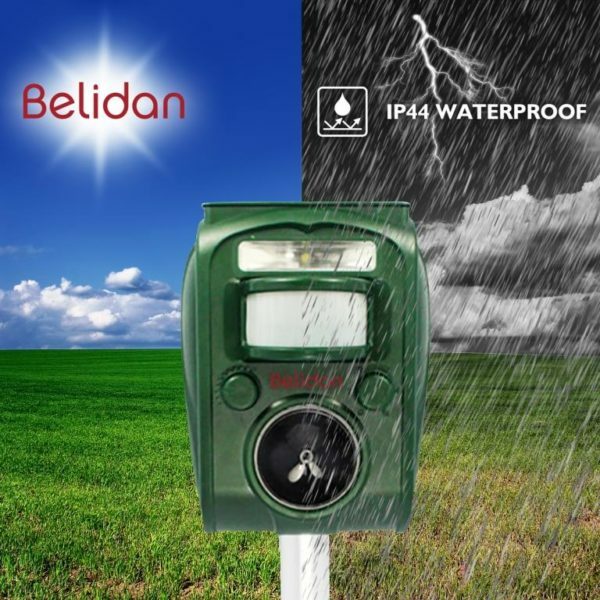 Advanced IPX44 waterproof technology construction for any weather conditions. Our animal repeller is built up with the highest quality materials to the highest quality standards you should expect. SAFETY. For a very infestated area consider placing more repellers in the area. The product is ultrasonic and it can take some weeks to have full effect because it is not chemical. Under heavy rain remove the repeller from the ground and put it in a dry space. 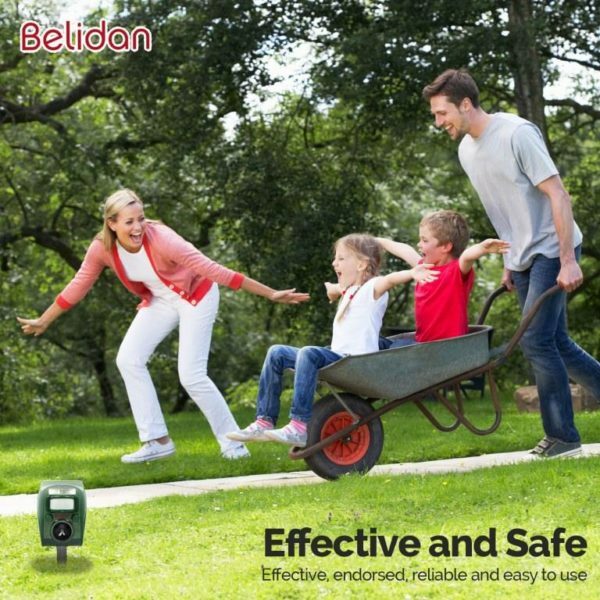 Take care of your lawn or garden and select now our animal ultrasonic repellent, raccoon repellent, skunk repellent and bird repeller today! Are you struggling with unwanted cats, dogs, bird or pests in your lovely garden? 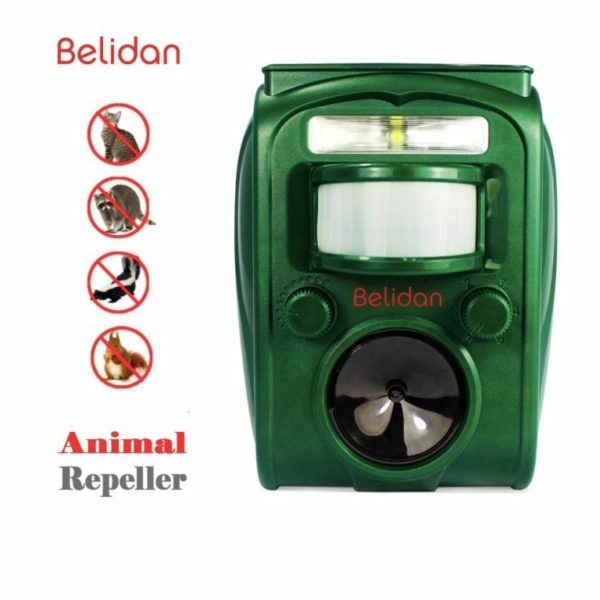 Our newest Belidan Upgraded Solar Animal Repeller and Bird Repellent is the solution to your problem. This cats, dogs, birds and pest repellant is just what you are looking for! It safely and effectively repels mice, rats, squirrels, dogs, foxes, martens, raccoons, badgers, skunks, bats, birds, rodents, boars, cats and more by using a strong ultrasonic wave and a stronger flashing LED and an alarm (new features). This pest deterrent scares the pests and other unwanted animals making them flee the area; this IS what you need to free your yard up of unwanted animals. 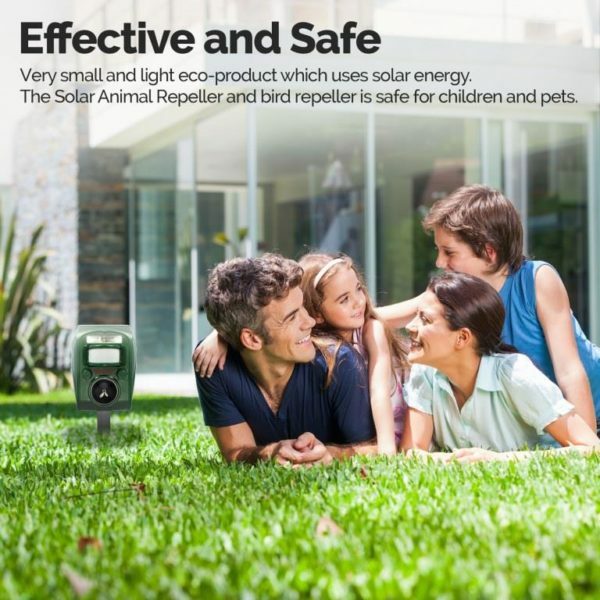 No more unwanted animals, uses solar energy; it is eco-friendly and safe for children and pets. Garden, Park, Lawn, Yard, Farm etc. It will definitely help you to chase away the pests and fully enjoy your garden or yard!